One woman's success does not detract from your own...if anything it inspires others to start living the life they always imagined! Rounding out my final female founder interview series is Lea Mayer. Lea (pronounced Leah not Lee hah! ), is the creator, owner, designer, customer service rep, and production line for Lulu and Lea. She has a degree in Textile design and a background working in apparel design. When I first starter Pax’s account I was asked to be in my first collaborative giveaway and I was invited by Lea! I had no idea what I was doing and kept ask her questions about what to do and if I was doing everything right. She was always so sweet to answer and it ended up being a great experience for everyone! When starting new things it can be really overwhelming because there is just so much information out there and things to do. It’s such a joy to be able to have such a strong community of like minded people! In our interview Lea mentions that just diving in is really the solution to the overwhelm and that overthinking can delay one from living their most fulfilling life! Thank you so much Lea for your time - it was such a blast to learn more about Lulu and Lea! Make sure you follow @shopluluandlea and give your pup a beautiful gift! Please tell us a bit about your background both personally and professionally. I have lived in the Philadelphia area most of my life. I grew up outside of the city in Southern NJ. Growing up I always had a passion to be in the design world. As a little girl I would watch HGTV and always thought I would be an interior designer. I later really learned to love fashion design as well. When looking at colleges, design programs were my focus. I landed at Philadelphia University (now Jefferson University) in their Interior Design program. The first year was whirl wind of architecture classes and as much as I found it interesting and certainly challenging, it didn't feel like what I really had a passion for. I switched to textile design and fell in love. I absolutely loved not only the design aspect but the technical as well. After graduating I worked as a CAD designer for Bed Bath and Beyond, then moved to their subsidiary Harbor Linen as their first in house designer working on contract custom bedding and drapery. I really enjoyed it but again didn't feel a strong passion for it. That lead me back to fashion to try to find a career I could love. I worked for a well known apparel brand in Philadelphia working in their design department. It felt like I landed the dream job and I was so excited to dive in. After three years of giving that job literally everything I could possibly put into, and admittedly letting it affect me in ways I won't get into I decided it was time for a serious change. I left without a plan but knowing I really needed a positive change and inspiring work environment. At the time I had an instagram for Lulu, my puppy, and loved the community that I had never expected to find there. I also could never find accessories for her that were my taste or quality that blew me away so I decided with my new found freedom to start Lulu and Lea based off this idea. How did you get your idea or concept for the brand? Just as above in my background it just felt like a void in the market. I am willing to pay a higher than average price point to get high quality well designed products for nearly anything so why not dog accessories! I really wanted to create something special that no one else was doing. Tell us more about your brand and what you do! I have taken my background in textile design and really made my knowledge and love of textiles what makes my brand special. 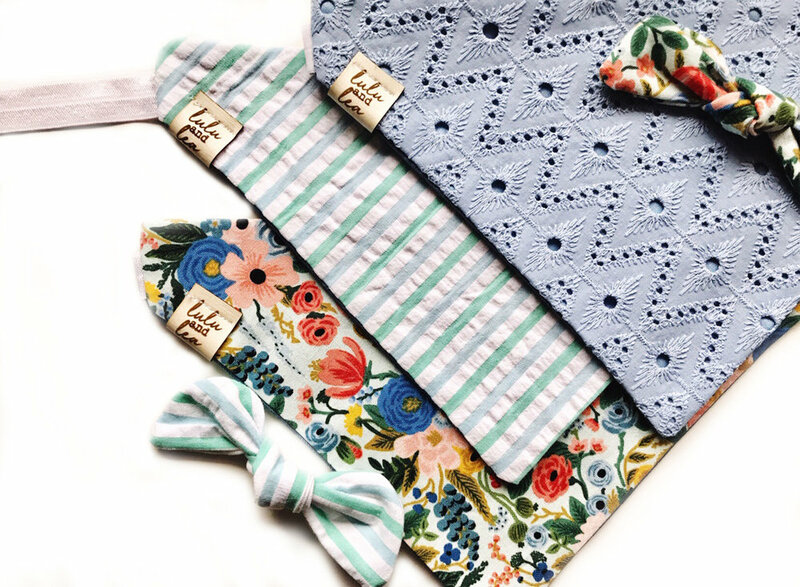 Lulu and Lea products are always made of high quality fabrics that are sometimes a little unexpected, like when I did velvet or our new eyelet or embroidered styles for spring. I really like to take really special fabrics and allow them to be what elevates my fairly simple designs. Looking back would you do any thing different? Hmmm! I don't know I'd do anything different. I am a firm believer in everything happens for a reason and I think although the path has not been easy I have learned so much about the business, and myself, along the way. I love the creative freedom and the ability to take risks. Designing for corporate companies always felt restrictive to me. There was always someone there to tell you that it wasn't good enough, a good design, idea, etc. With being an entrepreneur I love having the freedom to try. The person saying no may have been right but I think there is something really valuable about learning for yourself. Share your favorite moment or moments while growing your business. Oh gosh, that's hard because I've had many! One, I find it so rewarding as I grow and continue to succeed, especially when so many people in the beginning couldn't see my vision. Second, and more importantly, I have to go back to the connections I've made. Instagram is where I built my business from and the people I have made connections with there is invaluable. People, most people, are so wonderful and want to support you and help build your dream. I love when a customer tags me and they are just in love with the styles they've just received. Thats the best moment. What are some of the challenges of being an entrepreneur? I think balance. Balancing life and owning a business can be a struggle... Especially a very small business, my staff is myself and I just hired a part time assistant. So it can be hard to put down the work and separate that from my personal life. Especially in a world where everyone is used to Amazon prime and such immediacy. It feels like you need to be present 100% of the time. Advice for other entrepreneurs or those looking to get started? Just dive in! I think we can be our own worse enemies and the more you sit around and think about what you want to create the less likely you are to just do it. Diving in can be scary but you learn so much along the way. Is there anything else you'd like for us to know? As I'm filling this out its International Women's Day and I just think women need to support each other more! It's easy to feel competitive and protective of your work but I think everyone has something valuable to bring to the table. I heard recently, and I cannot remember where, that one women's success does not detract from your own and that really resinated with me. Lea is absolutely right! One woman’s success does not detract from your own abilities. It can be challenging to start a new project when social media promotes so much comparison. But, there is room for all of us at the top & I’d love to have you contribute to leader of the pax! Fill out a form below so we can get started! Older PostHow surrounding yourself with like-minded people can boost your confidence!